I’m a farm girl at heart, even though I was raised in the city. As a child, our family had a weekend home in Washington state on Silver Lake. My favorite part of heading to the lake for the weekend, was driving through the Fraser Valley farmland on our way to the border. Miles and miles of red barns, white board fences and horses grazing on green grass. Whenever I’d leave the kitchen door open, my Dad would yell, “Were you born in a barn!” … like it would have been a bad thing? Anyway, barns are dear to me, and that is what led to this trellis design. 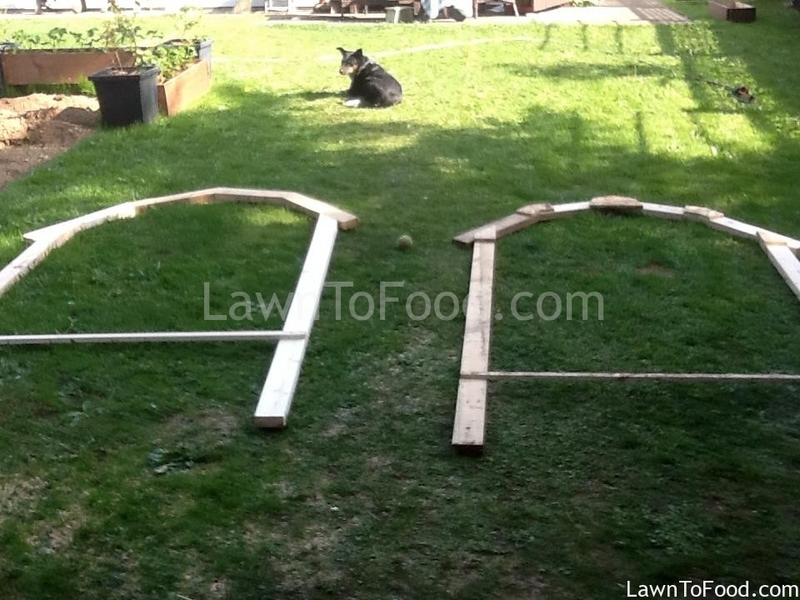 I laid out 4 short pieces of 2×4 on the grass and shaped it like a barn roof. Using a pencil, I drew on the angle that at which I would cut the 2×4 ends to form the barn roof shape. Once I had one set of 4, cut and laid out, I copied the second set of 4 short 2×4’s to match the first. To join all my angled 2×4’s, I used leftover pieces of plywood. The plywood pieces were attached with 1″ screws, on to the 2×4’s at the joints. A jigsaw was used to cut the plywood pieces flush with the 2×4. I used the same plywood joining method to attach the 2×4 posts to the barn-shaped roof trusses. The last step was to screw on several 30″ boards to hold the 2 trellis support pieces together. It spent last season in the back yard as a pole bean trellis. This year, I moved it to the new front yard vegetable garden, where it will once again trellis pole beans as well as clematis, for some color. 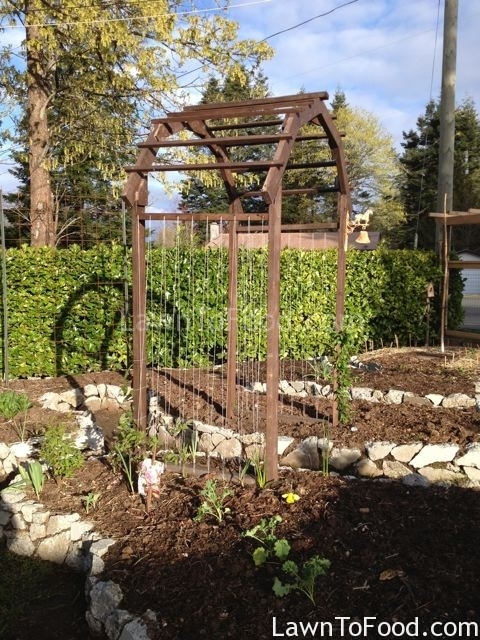 I love how the trellis provides an overhead connection between 2 garden plots, creating a covered pathway. 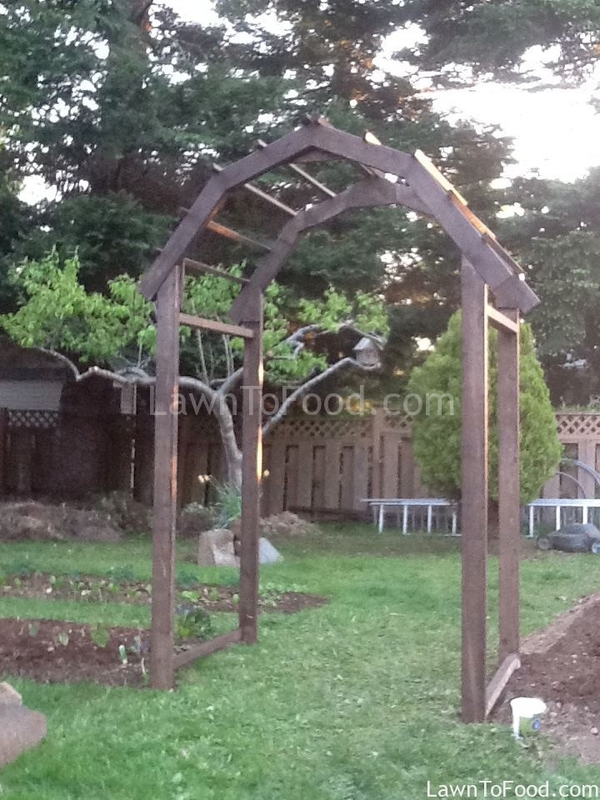 This entry was posted in Cool Carpentry Ideas, Crop Planning, Growing Food, Projects and tagged barn, bean, free-standing, trellis by Lynda. Bookmark the permalink.